Tibetan Life, Issue #001 -- Delicious Tibetan Recipes! Welcome to Tibetan Life's E-Zine! Have you tasted traditional Tibetan momos? 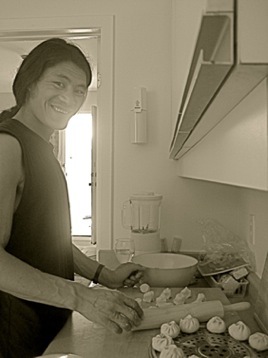 Here is a picture of a cute Tibetan guy actually making momos to inspire you! Get Recipes for delicious meat momos or veggie momos. You can also make half moon shapes or you can experiment! Finely chop the carrots, onions and cabbage. Mix together with the crumbled tofu. Add salt, pepper, ginger and garlic to taste. Tibetans don't ask people they meet on the street how they are...they always ask where they are going! Karma is your experience, your experience of your body, and your experience of your mind. That is karma. Karma is Sanskrit, words is Sanskrit. What really means, meaning of karma is cause and effect. So, your experience, feeling happy, unhappy, by physically, by mentally, is another reaction. Can you realize? That is result. One action produces another reaction. That is karma. As science say—it not only the East philosophy—science explain all the matter relating each other. Do you? Do you study that kind of? In the West, science, they explain all matters relying on each other. Okay? Clear, I think! All the existence, external, internal, not come just accidentally. The energy of external, energy of internal, everything relating in each other. Example, your body, just simple example, energy of your body is relating from your parents. Your parents' body is relating another body. Those kind of things karma. Clear? Good, thank you. Stuck for that perfect Christmas gift? Tibetans being mostly Buddhists don't celebrate Christmas. Their most important holiday of the year is the Tibetan New Year or Losar. (Lo is year and Sar means, you guessed it, new). But most of us in the west do. (Tibetan husbands with foreign wives better start if they know what's good for them!) If you are panicking and don't have a clue what to get that special someone, I think I can help you. What a perfect way to show your support for Tibet and give someone a personal gift. Have their name translated into Tibetan and printed on a tee shirt. I just had one made for my hubbie and will send you a pick when it arrives! So we know the Tibetans are into this, how about you? A positive thought and a negative thought cannot stay in your mind at the same time. Therefore, when an unhappy negative thought comes into your mind, by just thinking a wee happy thought, the negative thought will be pushed right out of your mind. For stubborn and determined negative thoughts, it might take holding that positive thought in your mind for a few moments to completely get rid of it. Try it and see that it is really your choice to remain happy or not! The Dalai Lama and the Tibetans have tried just about everything to regain their country but the Chinese government won't even talk to them. What can they do? If you have an idea to help these gentle, fun loving people go home, please post your idea here.